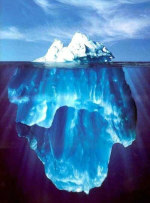 What do you and this iceberg have in common? How is the “Secrets” Course different? “Secrets of Manifesting” Course that starts on May 31st. released to the public until June. the launch of the “Secrets of Manifesting” E-Course. audio sessions) will help you each step of the way. applies in YOUR day-to-day life. >Another question is, do you plan to offer this again next month? it will be offered again. If you’ve missed the “live” course, we’re now offering the audio CD version (worth all the extra bonuses).